NVIDIA has announced a $250,000 gift to the Klaus Schulten Memorial Fund. Zan Luthey-Schulten and her late husband, Klaus Schulten, are shown. Schulten led the Theoretical and Computational Biophysics Group, which was founded in 1989, the year the Beckman Institute opened. Luthey-Schulten, a professor of chemistry, also often collaborated on research with her husband. NVIDIA recently made a gift of $250,000 in memory of Klaus Schulten, which recognizes his visionary leadership in biological physics and computational biology. In recognition of Klaus Schulten's visionary leadership in biological physics and computational biology, NVIDIA recently made a gift of $250,000 to a fund established in his honor. Schulten, a University of Illinois Swanlund professor of physics, was an innovator in the use of computational methods to study the chemical and biological processes driving living cells. He died Oct. 31, 2016. The $250,000 gift from NVIDIA honors the legacy of Klaus Schulten, a pioneer in biological physics and computational biology. 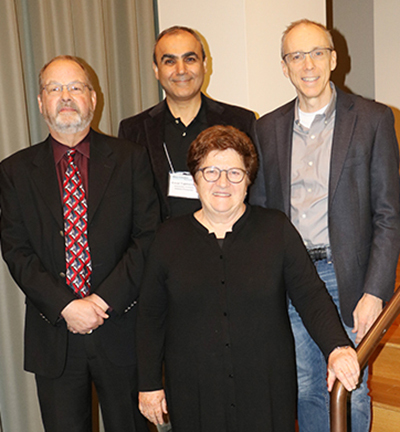 Front row, Zan Luthey-Schulten, a professor of chemistry and Schulten’s widow; back row, from left, Mark Berger, senior alliance manager for life and material sciences, NVIDIA; Emad Tajkhorshid, a professor of biochemistry and leader of the Theoretical and Computational Biophysics Group; and Jeff Moore, the director of the Beckman Institute for Advanced Science and Technology. “Klaus embraced new technologies that could advance our computational efforts in the field of biological physics and imaging,” said Zan Luthey-Schulten, a professor of chemistry, Schulten’s widow, and longtime scientific collaborator. “Without NVIDIA’s GPUs there would have been no HIV virus capsid simulations with NAMD/VMD or whole cell stochastic simulations with Lattice Microbes/VMD software. Schulten was a research powerhouse, leading a team of more than 30 students and postdoctoral scientists in the Theoretical and Computational Biophysics Group (TCBG), which he founded at the Beckman Institute for Advanced Science and Technology in 1989, the year it opened. With a background in chemical physics and a keen understanding of the potential of powerful computers to model biological structures and the chemistry that drives them, Schulten led the development of software that allows scientists to observe how molecules behave and interact at the atomic scale. These include VMD, a program for the interactive display, animation, and analysis of large biomolecules; and NAMD, a large-scale molecular dynamics simulation program that incorporates the best available experimental data while accounting for the moment- by-moment chemical interactions of 100s of millions of atoms. Schulten’s group made fundamental contributions to numerous areas of biology, most recently to understanding animal vision, photosynthesis, force generation in cells, membrane channel dynamics, and large-scale cellular organization. He and his colleagues revealed the precise chemical structure of the HIV capsid which will contribute to a deeper understanding of its biological function in the cell. NVIDIA designs the world’s leading graphics processing units (GPUs) for high-performance computing. NVIDIA GPUs are used in many of the world’s premier supercomputers, including Blue Waters at the National Center for Supercomputing Applications at the University of Illinois, which Schulten used to develop a “computational microscope” that captures biomolecules in action. The University of Illinois at Urbana-Champaign was named NVIDIA’s first GPU Center of Excellence in 2008. The TCBG at Illinois, one of the active participants of the GPU COE, was one of the world’s first research groups to leverage the parallel architecture of the GPU to accelerate research in the field of computational biophysics. TCBG has successfully accelerated NAMD/VMD, a popular parallel molecular dynamics application that analyzes large biomolecular systems. The Klaus Schulten Memorial Fund was established to support theoretical and computational biophysics. More details on the fund can be found at go.illinois.edu/KlausSchultenGift.